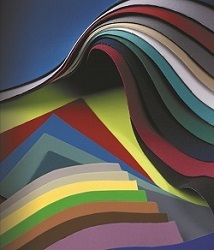 VELCRO® Brand VELTEX® laminated loop fabric is a 60” wide laminated product with a nylon face fabric, polyester foam core, and nylon tricot backing. Designed for engagement with a variety of hook products, VELTEX® laminated loop fabric can be used in Trade Show Booths, Display Boards, Jewelry Cases, Medical Applications, and much more! The full roll size is forty yards, and we also supply cut yardage in as little as 1 yard increments. Custom fabrication, such as inserting grommets, slitting and sewing on VELCRO® Brand VELTEX® laminated loop fabric is available. Please call 800-635-5252 for a quotation. We stock the following colors: White, Black, Beige, Eggshell, Royal Blue, Navy, Antique, Sterling, Platinum, Spanish Red, Jungle Green, Chrome Key Green, Chrome Key Blue, Purple, Ice Blue, Pearl Bright, Par Green & Glow Lime. VELCRO® Brand VELTEX® Loop Fabric 60" wide, sold by the yard.